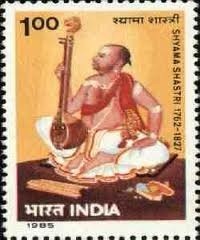 I noticed today that the random selection of Carnatic Music that I have presented so far in this blog does not include any by Shyama Shastri (1762-1827), one of the Carnatic Trinity. I associate Shyama Shastri strongly with Raga Ananda Bhairavi and the first song which comes to mind is Marivere Gati so I have naturally selected this song for today. Raga Ananda Bhairavi is quintessentially South Indian. I have read that it has origins in the folk music of the South, though it could well be the other way around. Shyama Shastri has composed a number of beautiful songs in this raga making it his very own. In fact, he is said to be responsible for the raga being sung as it is today as he made some changes to the scale. If he was indeed responsible, we must all thank him for it sounds quite beautiful like this! Shyama Shastri was a great devotee of the Goddess Kamakshi and like many of his compositions, Marivere Gati is a prayer to the Goddess Bangaru Kamakshi of Tanjore, the Goddess of the temple where he was the priest. ‘Who else have I but you?’ says the poet-composer. ‘You protect those who seek sanctuary (sharanagata)’ says he. Nammiti Nammitini he cries, ‘I trust in you, I trust in you’ ! The words are a heartfelt plea and Ananda Bhairavi is the perfect raga for the mood the words create. Every time I hear this song, it manages to slow my heart beat down and gentle any restlessness I may have. The doctors should prescribe this song for hypertension ! To know more about this raga, click here. You can find the lyrics here. For a better translation, go to this site. For presenting this composition, I have deliberately chosen a young artist; it makes me happy to see young voices take up their inheritance. The young M.Balamuralikrishna shares both the initial and name with the illustrious maestro. Born in 1985, this young man with prodigious talent has a style reminiscent of his elders and a voice which will no doubt lead him to greater success in this field. While on young artists, the Akkarai sisters are young violinists to take note of. Here is a performance from 2011 (they sound even better nowadays). For a more seasoned performance, I very much like T.M.Krishna’s Anand Bhairavi, his style suits this raga perfectly.However I think this is a old recording.